The time has come: the new IPCC report is here! After several years of work by over 800 scientists from around the world, and after days of extensive discussion at the IPCC plenary meeting in Stockholm, the Summary for Policymakers was formally adopted at 5 o’clock this morning. Congratulations to all the colleagues who were there and worked night shifts. The full text of the report will be available online beginning of next week. 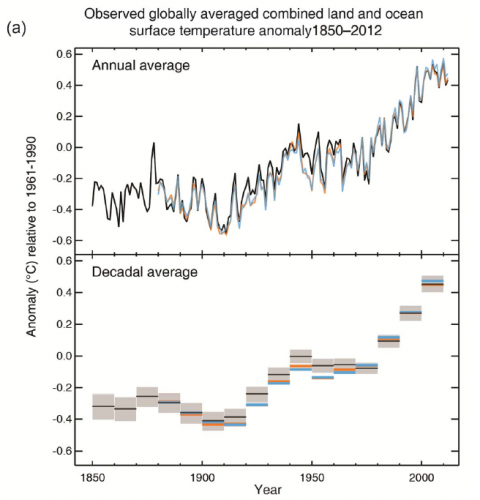 Realclimate summarizes the key findings and shows the most interesting graphs. Update 29 Sept: Full (un-copyedited) report available here. It is now considered even more certain (> 95%) that human influence has been the dominant cause of the observed warming since the mid-20th century. Natural internal variability and natural external forcings (eg the sun) have contributed virtually nothing to the warming since 1950 – the share of these factors was narrowed down by IPCC to ± 0.1 degrees. The measured temperature evolution is shown in the following graph. Figure 1 The measured global temperature curve from several data sets. Top: annual values. ​​Bottom: averaged values ​​over a decade. Those who have these data before their eyes can recognise immediately how misguided the big media attention for the “wiggles” of the curves towards the end has been. Short-term variations like this have always existed, and they always will. These are mostly random, they are (at least so far) not predictable, and the IPCC has never claimed to be able to make predictions for short periods of 10-15 years, precisely because these are dominated by such natural variations. The last 30 years were probably the warmest since at least 1,400 years. This is a result from improved proxy data. In the 3rd IPCC report this could only be said about the last thousand years, in the 4th about the last 1,300 years. The future warming by 2100 – with comparable emission scenarios – is about the same as in the previous report. For the highest scenario, the best-estimate warming by 2100 is still 4 °C (see the following chart). What is new is that IPCC has also studied climate mitigation scenarios. The blue RCP2.6 is such a scenario with strong emissions reduction. With this scenario global warming can be stopped below 2 ° C.
Sea levels are rising faster now than in the previous two millennia, and the rise will continue to accelerate – regardless of the emissions scenario, even with strong climate mitigation. (This is due to the inertia in the system.) The new IPCC scenarios to 2100 are shown the following graph. Figure 3 Rise of the global sea level until the year 2100, depending on the emissions scenario. This is perhaps the biggest change over the 4th IPCC report: a much more rapid sea-level rise is now projected (28-98 cm by 2100). This is more than 50% higher than the old projections (18-59 cm) when comparing the same emission scenarios and time periods. Already, there are likely more frequent storm surges as a result of sea level rise, and for the future this becomes very likely. The Greenland ice sheet is less stable than expected in the last report. In the Eemian (the last interglacial period 120,000 years ago, when the global temperature was higher by 1-2 °C) global sea level was 5-10 meters higher than today (in the 4th IPCC report this was thought to be just 4-6 meters). Due to better data very ​​high confidence is assigned to this. Since a total loss of the Greenland ice sheet corresponds to a 7 meters rise in sea level, this may indicate ice loss from Antarctica in the Eemian. In the new IPCC report the critical temperature limit at which a total loss of the Greenland ice sheet will occur is estimated as 1 to 4°C of warming above preindustrial temperature. In the previous report that was still 1.9 to 4.6 °C – and that was one of the reasons why international climate policy has agreed to limit global warming to below 2 degrees. 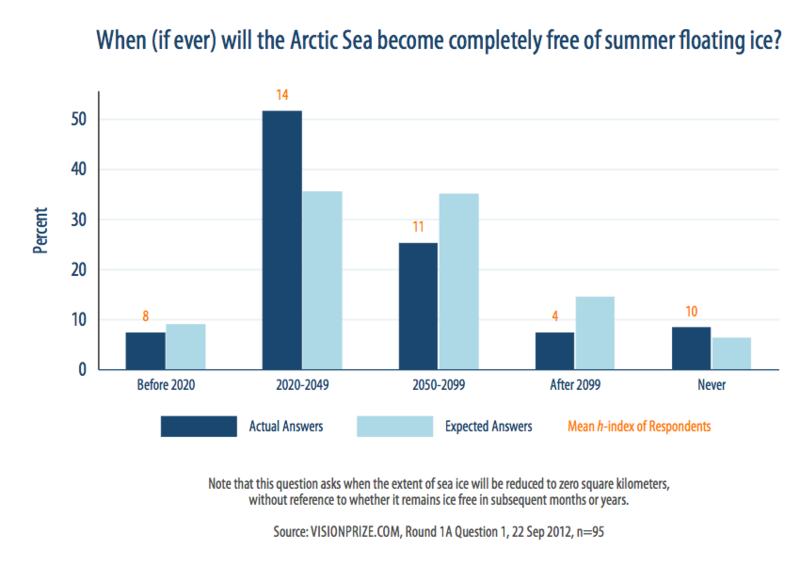 With unabated emissions (RCP8.5) the Arctic Ocean will likely become virtually ice-free in summer before the middle of the century (see figure). In the last report, this was not expected until near the end of the century. Figure 4 The ice cover on the Arctic Ocean in the 2-degree world (left) and the 4-degree world (right). The IPCC expects that dry areas become drier due to global warming, and moist areas even wetter. Extreme rainfall has likely already been increasing in North America and Europe (elsewhere the data are not so good). Future extreme precipitation events are very likely to become more intense and more frequent over most land areas of the humid tropics and mid-latitudes. 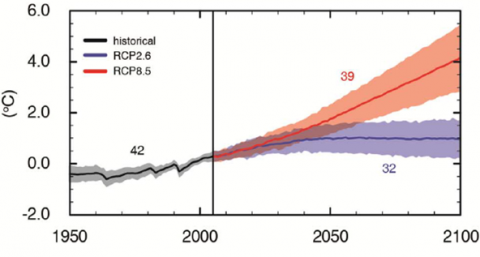 At high emissions (red scenario above), the IPCC expects a weakening of the Atlantic Ocean circulation (commonly known as the Gulf Stream system) by 12% to 54% by the end of the century. 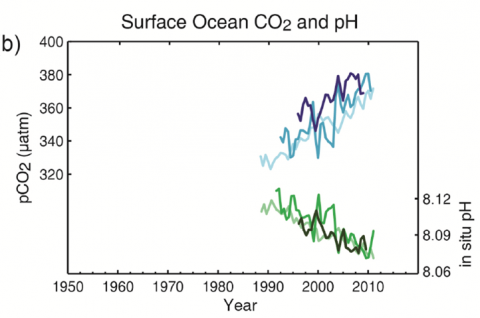 Last but not least, our CO2 emissions not only cause climate change, but also an increase in the CO2 concentration in sea water, and the oceans acidify due to the carbonic acid that forms. This is shown by the measured data in the graph below. Figure 5 Measured CO2 concentration and pH in seawater. Low pH means higher acidity. The new IPCC report gives no reason for complacency – even if politically motivated “climate skeptics” have tried to give this impression ahead of its release with frantic PR activities. Many wrong things have been written which now collapse in the light of the actual report. The opposite is true. Many developments are now considered to be more urgent than in the fourth IPCC report, released in 2007. That the IPCC often needs to correct itself “upward” is an illustration of the fact that it tends to produce very cautious and conservative statements, due to its consensus structure – the IPCC statements form a kind of lowest common denominator on which many researchers can agree. The New York Times has given some examples for the IPCC “bending over backward to be scientifically conservative”. Despite or perhaps even because of this conservatism, IPCC reports are extremely valuable – as long as one is aware of it. Update & Correction (28 Sept): The upper value of the sea-level range is 98 cm, not 97 cm – I overlooked the fact that IPCC corrected this between the final draft and the approved version of the SPM. Some media wrongly report a rise of “only” up to 82 cm by the year 2100. That is a misunderstanding: 82 cm is the average for the period 2081-2100, not the level reached in 2100. Both the curves up to 2100 and those 20-year averages are shown in Fig. 3 above. Note that the additional rise of up to 16 cm in the final decade illustrates the horrendous rates of rise we can get by the end of the century with unmitigated emissions. It is also worth noting that the 98 cm is the upper value of a “likely” range (66% probability to be within that range). As IPCC also notes, we could end up “several tens of centimeters” higher if the marine-based parts of the Antarctic ice sheet become unstable. Leading ice experts, like Richard Alley and Rob De Conto, consider this a serious risk. I am horrified, but this was expected. On a “positive” note, I won my wager on projected sea level rise. 1) are all the graphs in your post from the current .pdf release (Sep 27) of the SPM document? 2) for your graph showing “Figure 2: The future temperature development” – why does the vertical line appear to go through 2005. Shouldn’t it be updated to be at 2012 if that is intended to show the cutoff between historical and model? 3) also, with respect to the Figure 2 projections – for the 2 scenarios shown (red and blue): are there a range & best estimate for the TCR / ECS associated with the scenarios? The Working Group 1 paper makes no acknowledgement of the impact of natural feedback due to the faster Arctic warming taking place. Policy needs to be informed by an accurate picture, we cannot keep dumping carbon into the atmosphere. Unfortunately,as can be seen from the source material and as the UK Met Office [UKMO] has repeatedly admitted, as the IPCC’s ‘Representative Concentration Pathways’[RCP] scenarios all omit key feedback effects [such as Arctic and Permafrost melt]so these figures under-estimate what lies ahead. I think you should point out that the “best case scenario”, RCP2.6 is predicated on global carbon emissions peaking before 2020, and then falling fast, with the entire world becoming carbon negative by the 2070s. When the RCP scenarios were first picked, this was considered to be too unlikely to be worth looking at. The plan was to go with a higher scenario, RCP2.9, which, together with RCP4.5 bracket the lower 5% and upper 95% confidence interval for what can be achieved with strong mitigation policies. However, RCP2.9 didn’t keep temperatures under 2C of warming (over pre-industrial levels), so they decided to go with the more ambitious RCP2.6, just so there would be at least one scenario that kept below the politically important 2C threshold. Analysis is still ongoing for figuring out what it would actually take to achieve RCP2.6 (and will be release with the Working Group 3 report next year). But the key point is that it has to get us to net carbon negative (from all sources) within 60 years. In reality, the strongest (practical) climate policies imaginable will probably produce a future somewhere midway between RC2.6 and RCP4.5. RCP 2.6 gives 0.9-2.3 K above preindustrial, right? So a good chance to stay above 2 degrees, but also still a significant risk to go higher. And for SLR there seems a 5% chance of more than 98 cm by 2100 at RCP 8.5, so that’s also a risk we should consider, right? so even when we add ocean and air temps together we still get that 15 year lull (natural variability of the ENSO cycle) when it has been reported all over that ocean heat is where all of the missing heat has seemingly gone. I would of thought that 15 year hiatus would be more upward. Curiously, I am seeing on some TV services like BBC indications that the new IPCC report is somehow seen as playing down climate change – at least to the extent of trotting out deniers. Having paged through the Summary for Policymakers and seen this article I don’t know where they are getting this. The old fake balance I suppose – you know the way they always follow the market reports at the end of the news by a Trotskyist rebuttal? Anyway thanks for posting this – a nice summary. IPCC is as usual half a decade late, and this time it is a dozen or more positive feedback loops short. I am wondering what the right winger response will be. I looked for the word pause or hiatus. Nothing there, which is good. I don’t think there is a real pause anyways. It is simply cooling ENSO events compensating the underlying warming. Why not do something this simple to get the point across? Concerning sea level rise I worry that there is still so much that can not be proven that it has been left out. Listening to scientists who are working on Greenland they think that there may be a sudden collapse. (not overnight but a real acceleration). There is a lot going on in the depths of the ice that we do not understand but can only suspect. Of course I meant ‘below 2 degrees’ instead of ‘above’ in my comment at #7. I’m a little confused with the sea ice extent diagram – the 2-degree september extent is HIGHER than the current 0.8C extent. Is the arctic going to “recover”?? [INSERT TABLE SPM.1 HERE] or [INSERT FIGURE SPM.6 HERE]? I’m a bit puzzled at the September sea ice map for a 2 degree world in 2080-2100. Even the smaller subset version looks comparable to this years september (which was quite a bit higher than last). Is the label correct? I know models are lagging reality but I though they were getting a bit closer than that! On the sea ice, Figure 4 (SPM.8 c) looks seriously problematic. The left panel for a +2°C world appears to show a September extent late this century that is greater than the observed extent in recent years. That’s at barely +0.5°C (vs 1961–1990, or is that meant to be pre-industrial … just me, or do those damn goal posts keep moving). It would have been better if the SPM admitted that CMIP5 still can’t do sea ice. PIOMAS (and CryoSat-2) say it’ll all be gone by 2020 (see website link). How much is several ? Ten maybe ? I have medium confidence that they are incorrect. 3)EAIS: more unstable than we thought. To put some numbers to this, I expect a saddle collapse at 67N in Greenland, and NEGIS acceleration over some of the deepest icebeds on earth. PIG eating into Thwaites on the east even as Thwaites retreats south. EAIS is showing signs of wobbliness. Put me down for a meter, best case, from AIS and GIS alone. Has anyone produced a graph of the last 100 year global temps where the element that is attributed to man’s influence takien out? How would that look? Where do we think we would be right now. What degree of cooling would we have seen over the last 15 years? Figure SPM.9: Projections of global mean sea level rise over the 21st century relative to 1986–2005 from the combination of the CMIP5 ensemble with process-based models, for RCP2.6 and RCP8.5. The assessed likely range is shown as a shaded band. 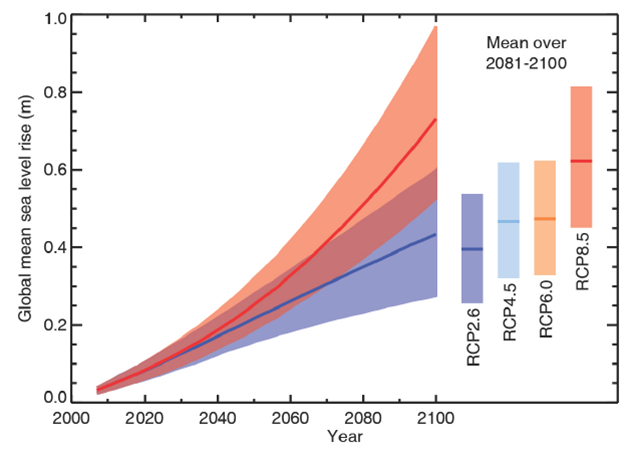 The assessed likely ranges for the mean over the period 2081–2100 for all RCP scenarios are given as coloured vertical bars, with the corresponding median value given as a horizontal line. Calculated from projections as 5−95% model ranges. These ranges are then assessed to be likely ranges after accounting for additional uncertainties or different levels of confidence in models. There is more. See a comment by Aslak Grinsted. How is this value calculated, especially since there is a great discrepancy between the models and observed temperatures, that this tome completely fails to account for. I do not consider the various “It might be due to… or to…” to be sufficient explanations. Please also tell us what “human influence” comprises of and the relative proportions of the warming seen and how this differs from the warming seen in the instrument record from the 1880s to the 1940s. I regard the claims of accelerating increase in sea levels to be unsustained, as the record shows a steady 3.2mm/year rate. I see now mention of the increase in Antarctic sea ice, nor the cooling seen over the majority of Antartica, so what’s happened to “Polar Amplification”? How have previous reports faired with their prediction (Or scenarios as they seem to be called)? It would be interesting to understand in more detail what has led to the increase in confidence in the attribution statement. I have heard hints that it is related to better models, more attribution, better observations and so forth, but these were a summary from a senior scientist not directly involved in this report (but involved in the other 4 reports as a lead author or lead reviewer). Seriously though, as I read through the summary and I tried to reconcile it with what I actually see being done by our so called policy makers. My heart sank a few notches. And when I read comments about anthropogenic climate change in the mainstream media or online sites like for instance at the Wall Street Journal it quite frankly almost leads me to despair! Best Hopes that there is still might be time to change the fundamental paradigms on which our current global civilization is based! The caption attached to the figures in the post above have been simplified and in the case of Fig 4, this is perhaps a simplification too far. The two maps are for RCP 2.6 and RCP 8.5. The first of these which has raised the concern here results from global emissions dropping very very quickly (beginning before 2020) and the resulting global temperature rise is projected at 0.95ºC – 2.6ºC above pre-industrial. At the lower end this is not dissimilar to today’s temperatures (+0.1ºC). The average RCP 2.6 above pre-industrial is a little less than 2ºC (1.65ºC?) and with the famous IPCC under-estimation of Arctic Sea Ice loss, the map perhaps then begins to enter the realm of being understandable. Stefan (#7) and Martin (#21), thanks for the clarification. That’s a confusing statement by IPCC, as Aslak Grinsted also notes. I’m curious what they have to say about the semi-empirical models and expert elicitation in the full report. A worst-case of 1.5-1.7m of SLR in 2100 seems to be the implication of all this. We could even argue that almost 2m can be considered the worst-case, since they mention this, but then say there’s no consensus on this. But how much consensus is needed from a precautionary perspective? The more risk is involved, the less consensus is needed, I would think. You could also read some of the other recent articles here at RealClimate and use “Start Here” at the upper left. If you are just repeating the various points that have grabbed your attention from the clever alternate universe of counterfacts, I’d suggest you take a closer look at what they are trying to prevent you from seeing. It’s easy for a nonscientist to tease out how it is not ethical but very well funded and organized to mislead people like you and prevent action. Remember that many of the accusations are exact duplicates of honest points just cleverly reversed in meaning, since it is easier to snark and destroy than to build understanding. For lay readers, the graphics in the report are terrific, as presented above. Was there any discussion/information on aerosols part in variables of measurements? IMO aerosols are an important part in understanding what is happening. Is there any one or group focusing on this issue? and if so then links please. Something that Gavin had in one of the other comment strings fits here as well: “Here’s a test: If you read something written by someone who basically knows what they are talking about and it seems absurd to you, ponder – at least for a second or two – that it might be your interpretation that is at fault rather than the statement.” I’d certainly second Susan’s suggestions as the SKS site and Start Here at Real Climate as good places to start for a fundamental understanding of the science. Beg pardon? The IPCC models assembled into Figure SPM.7 and the models used in CMIP ensembles show annual “ups and downs” in both temperature and sea ice predictions. Amusingly, “skeptic” websites are often full of irate comments denouncing the “commie BBC” for its “pro-warmist” bias. I think climate change reporting is generally a massive failure of journalism. There are exceptions to this, but where are the front page headlines to wake us all up to urgent action? I’m not confident that many journalists who report on / criticise IPCC reports have ever actually read one, otherwise it’s hard to understand the endless obsession with that one mistake about Himalayan Glacier melting in AR4 WG2…the BBC has mentioned that mistake very prominently at least twice again this week, with no context given about the size of the error compared to the size of the report etc. I would hope that anyone who’s read part of any IPCC report might be able to find something more interesting to talk about than that single error. It’s hard to know the causes of the BBC’s poor coverage but I suspect that it’s partly a mixture of ignorance (if you don’t know anything about the evidence then “skeptics” may seem to have a point, so you may end up parroting their statements), and fake balance …that’s presumably why this week the BBC gave Prof Myles Allen and Andrew Montford (seriously, Andrew Montford) roughly equal airtime in a news item about climate change. (Maybe Nigel Lawson was busy that day). We are just so lucky that it’s only major changes to the climate of the planet on which all known life depends that we’re talking about. I’m aware of what the article says about short timescales, TCS, and internal variability, but Steve McIntyre and Lucia Liljegren try to suggest that even at longer timescales (25 and 30) years the models differ significantly from the measurements. I notice that both do not include uncertainty for the measurements. Using the SkepticalScience trend calculator I get uncertainties that would make measurements overlap models uncertainty again, I think. But is that all there is to say about these graphs? Not a lot. And not remotely as much as the individual models that are combined into ensembles. Remember that each ensemble member contains one simulated realisation of natural variability, with the statistics about right but the timing completely arbitrary. Averaging evens this out, but complete removal would require an ensemble size of infinite. Alex, you’re confusing models with scenarios. Models are run repeatedly, each result is a bit different. Scenarios are sets of assumptions. Someone besides me should explain this better than I can. Fred Magyar #24, I love the suggested title (maybe WG2 can use it? ), although I would put some caveats around it (which spoils the snappiness). Hi Stefan. Can you please reproduce here the calculation giving 95% confidence? Is that 1-2°C higher than temperatures in 2013 or 1-2°C higher than some other baseline? If another baseline, how much warming have we seen so far from that baseline. NOAA’s 2008 State of the Climate report said 15 or more years without global warming would indicate what was delicately described as a “discrepancy” between prediction and observation, we’ve achieved that length of time now. We have CO2 emissions above Dr Hansen’s “Scenario A” levels, with temperatures at his “Scenario C” levels. Oh and why do you want me to run “analytics.js”? 1. What is the reason for the changed lower end of the climate equilibrium sensitivity likely interval since the last IPCC report, 1.5-4.5K vs 2.0-4.5K? I’ve read that the PALAEOSENS study, which summed up the paleoevidence, gave a likely range of 2.2–4.8 K. Dessler recently posted a video where he argues that it most probably is > 2.0K based on modern observations of feedbacks. CMIP5 climate models are also all > 2.0K (i.e. from Forster et al 2013) with an average of 3.2K. Is it recent studies based on recent (from 20th century) observations of temperature and forcings that is reponsible for the drop? 2. Are feedbacks from the carbon cycle included in the sensitivity assessment, i.e. melting permafrost or oceans becoming less of a sink? If sea level is rising at 16cm per decade over the last decade of this century, what beyond this. It has often been stated that a man should plant a tree, the shade of which he will never sit under. We should also avoid a catastrophe that will never effect us personally. This is the more recent of the flavors of denial, The Minimalist. When a scientist is using loaded words like “alarmists,” they are not using scientific reasoning, they are inserting their own beliefs and ideology. When we speak of denial of climate science we are discussing verifiable history. It’s not subjective. No scientist working to do good science would denigrate the fact that models and future-looking statements exist and need to be addressed. Extremes happen. The do-nothing crowd are now the dominant form of obstruction of solutions. What I find fascinating about the whole climate things at this point? Everyone worried about SLR which will be problematic but is really simply fixed: Move. It’s the food supply, Stupid. Fixing the food system = reducing atmospheric carbon. ‘Balanced’ reporting about the unbalanced climate. The actual release of the AR5’s SPM was finally announced by BBC Radio 4 on the “World at One” on Friday Sep.27th.2013. First came the headlines for the whole of the bulletin which of course included other items. The reference to the SPM was followed by a quote from someone who completely denounced the IPCC. Why was that in the headlines? Then in the body of the news, came the report itself followed by a return to this person, who was given a prolonged interview which involved a more extended attempt to rubbish the entire thing. It ended with a plug for the NIPCC together with information about where the listener could find it at the Heartland Institute’s web site. Anyone familiar with the “World at One” will know that interviewees can be given a very tough time by rigorous questioning. Not on this occasion. The interviewer was clearly out of his depth especially considering that he was dealing with a skilled operator like Bob Carter *. There are two areas where the BBC has been seriously deficient over the years. First in explaining the science, rather than just reporting some of its conclusions, and secondly in carrying out a forensic investigation into the campaign of disinformation about it. The nearest it came was when a climatologist recently referred to people who were trying to politicise ** the debate. This took all of two seconds. The result is that many people , including scientists, think that we are only faced with a difference of opinion. ** But she didn’t go on to say that politicisation includes a campaign of pressure on the BBC by those hostile to climate science. That’s not even close to understanding the problem. Start with the cyclic exposure of tides, seasons, and extreme events. The ‘century-event’ design point for defenses is becoming unreliable – extreme events like Katrina and Sandy show that it’s insufficient for new ‘worst-case’ scenarios. Fukushima built a 30-meter worst-case barrier, and then tectonics laughed at it with a shift, and the extra boost from sea-level rise combined to throw a 32-meter tsunami punch into it. It’s not very good advice to simply move … when the thing moving you is a tsunami or a coast-smashing cyclone. The second, and larger ubiquitous, issue is the pollution of aquifers and water tables in coastal areas. There are no barrier solutions to the repetitions of water-quality problems as ocean pressures build. An extreme parallel to that was the Tigris/Euphrates dams built during the latter years of the Saddam Hussein Regime – the redistribution of pressure resulted in salinity pollution in wells and the delta wetlands around south-east Iraq and Kuwait. This is a huge concern. Couple this with influx of salt from hurricanes, which can poison farmland for decades. Everglades are probably gone soon, I am glad i have travelled the Tamiami Trail while it existed, and I weep for those to come who will never see that wonder. There are many wonderful places we will never see in the sun and the breeze again. I think of all the water wells for all the coastal populations, and I see thirst where half the population lives. And to add another issue, the subglacial hydrology beneath GIS and AIS will respond to SLR, and not in a nice way. Disimissing the calamity with the edict “Move” is not only intellectually lazy, but worse, cruel and uncompassionate. Yes, we will move indeed, we will tread a trail of tears away from all the coastlines in the world. Generation upon generation will walk that long retreat, their laments will echo through the barren centuries, and our names will be a hissing and a curse in the mouths of our children. Yeah… wasn’t writing a book, just a juxtapostion. You can’t move from food insecurity, but you can move from the tides… and, btw, every point you raised is, in fact, fixed by moving. Get over yourself and understand the limits of the post. I *design* sustainable systems for goodness’ sake. The post was not about SLR, it was about the lack of attention paid to a far more dangerous, far more urgent, and far more complex problem to solve than SLR. And, yes, the best option in most cases is to move, not in small part due to the uncertainty of how high SLR will be. Only if they make really, really stupid choices. It’s not hard to apply principles of sustainable design to decision-making. If you have to move a community more than once, then the planning was done by people who had no business in the process. If more than one generation of any given city has to deal with moving, they deserve the penalties of their hubris in trying to make too dear a bargain with Nature. If you choose to move, do it right the first time. Far better to avoid the worst of SLR by getting the GHGs out of the air and into the ground in no small part by growing food, thus solving all three problems at once.